Ministry of Housing & Urban Affairs (MoHUA) has sanctioned 4.78 lakh (4,78,670) more affordable houses under Pradhan Mantri Awas Yojana Urban. Under PMAY U Housing Scheme, central govt. aims to provide affordable houses to the poor people in urban areas who does not have shelter of their own. Central sanctioning & monitoring committee has taken this decision in CSMC 42nd meeting held on 30 January 2019. In CSMC 42nd meeting, a total number of 940 projects in 10 states have been approved. The total project cost is Rs. 22,492 crore with central assistance of Rs. 7,180 crore. The total number of pucca houses sanctioned by the Union govt. reaches over 72.66 lakh under PMAY Urban Housing Scheme. Central govt. is going to construct these new houses in 10 states namely Andhra Pradesh, West Bengal, Uttar Pradesh, Tamil Nadu, Madhya Pradesh, Kerala, Maharashtra, Odisha, Bihar and Uttarkhand. Poor people belonging to various sections of the society can now apply online by filling Pradhan Mantri Awas Yojana Online Application Form. Central govt. 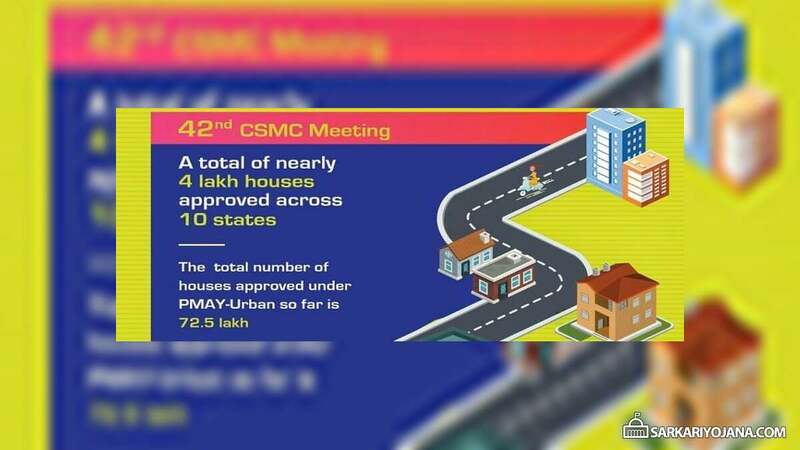 has sanctioned 4,78,670 more affordable houses in 42nd CSMC meeting held on 30 January 2019. After subsuming projects of Rajiv Awas Yojana (RAY) Scheme, the total number of houses sanctioned for urban poor under PM Awas Yojana Urban (PMAY-U) is now 72,65,763. Congratulations to my team led by Shri DS Mishra @Secretary_MoHUA for sanctioning close to a whopping 4 lakh homes under @PMAYUrban. All the poor people belonging to economically weaker sections (EWS), lower income group (LIG), medium income group (MIG) and higher income groups (HIG) can avail the benefits under PMAY Urban Housing Scheme. PMAY-U benefites includes assistance to get a new house of their own or getting subsidy for house reconstruction. PMAY – Urban Housing for All (PMAY-HFA) Scheme is a flagship scheme of Narendra Modi govt. to provide affordable houses to poor people. Go to the official website https://pmaymis.gov.in/ to get complete details on Pradhan Mantri Awas Yojana Urban Housing Scheme.